The Football Index is a completely different type of offer to what we have done previously. The Football Index works like the stock exchange. 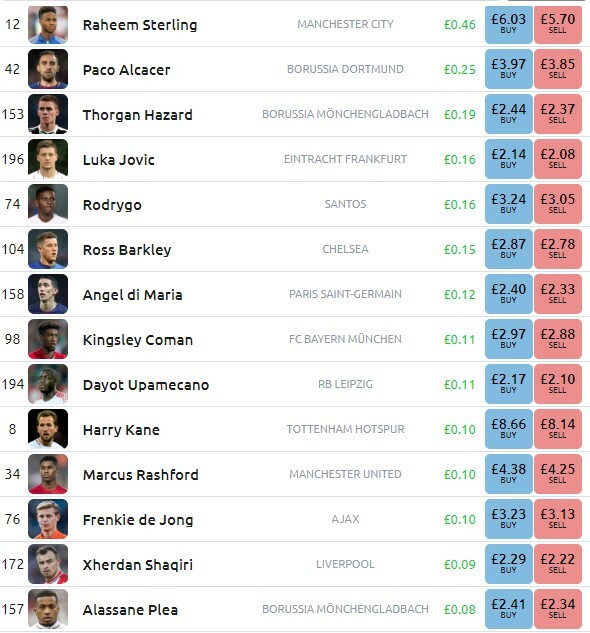 You can buy and sell shares in real footballers, the value of those shares will go up and down based on how popular that player is in the media. The more stories there is about a player in newspapers and online articles the more his value will rise. You can also earn dividends on your shares when your players are the most popular players of the day. This is called the buzz award. 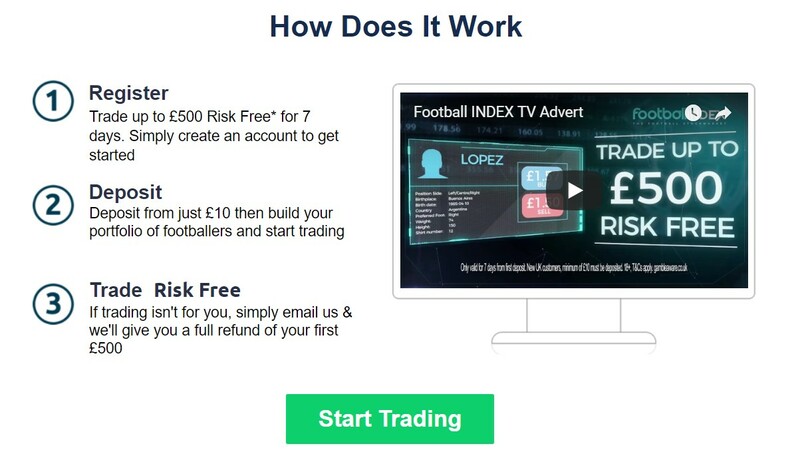 The football Index is not a system we can make guaranteed profits from long-term but they do have a £500 risk-free sign up offer that gives us a chance of making some money. There is no way to lock in a profit with this one but as it is completely risk free you might as well give it a go and see if you can hit a big win. So this offer lets us play with £500 in the first week and if we don’t make a profit we can get all of our money back. Click on the link above to register an account and deposit £500. You don’t have to deposit the full amount but the more you can deposit the more chance of making a profit. You do need to deposit at least £50 to be eligible for the offer. Once you have signed up you need to choose some players to invest in. This is the tricky part but our advice would be to pick players that aren’t too expensive as that way you can buy more shares and have more chance of turning a profit. If there is a big game coming up then look for players who will feature in that game and hopefully the players you pick will have a great game and get loads of attention from the media. The other option is to choose the big name players but these are much more expensive meaning you will not be able to get as many shares, however having these players increases your chance of winning the buzz award and getting daily dividends. We recommend choosing 1 or 2 players to invest in only. The format of the Football Index is quite similar to Betfair where you have blue and pink buttons. The blue buttons are the buy price and the pink buttons are the selling price. You will notice there is a gap between the prices so when you buy shares you need the price to rise around 3% to make a profit. Buying and immediately selling shares would see you make an immediate loss. Once you have chosen your players click the blue button and buy your shares. You can only buy 100 shares in one transaction. To be eligible for dividends from the daily buzz award you need to have owned your shares for 24 hours. Hopefully, your players will win this award and you will get some nice dividends throughout the week. The big name stars have a greater chance of winning this as they are featured in the media a lot more. After 5 or 6 days you need to sell all your shares if you want to take advantage of the risk-free offer. If you are in a profitable position and want to keep your shares then you don’t need to sell but to make this risk free you should sell now. If you have made a loss sell your shares and then either email customer support or contact them on live chat and request a refund. The Football Index will reset your balance to £500 (or whatever you have deposited) and you can withdraw. If you are in a profitable position simply sell your shares and withdraw your profit. Bear in mind there are selling fees that make your shares worth slightly less than it first appears. Congratulations! You have just completed the Football Index offer. Make sure you mark this offer as complete. At this point in your matched betting career, we recommend signing up to OddsMonkey. Joining OddsMonkey will allow you to keep making profits going forward. Make sure you have completed all the offers here on matchedbetting.co.uk and then check out OddsMonkey for a 30 day risk free trial.